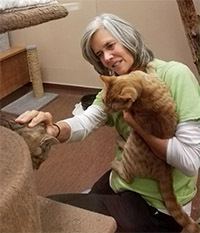 Thank you for your interest in volunteering at the Wisconsin Humane Society Door County Campus! Every day, volunteers help improve the lives of animals and they each play a vital role in the success of our shelters which care for more than 40,000 animals each year. Below you will find information about our volunteer program at the Door County Campus and how to become a volunteer. Due to the amount of training we require for most of our volunteer positions, we ask for a 6 month commitment for 2-3 hours each week. Volunteers come in for a regularly scheduled recurring shift on the same day and time each week. Volunteers must be 18 years of age or older. Youth ages 13-17 must be accompanied by a parent for all volunteer sessions. Volunteers must be able to read and comprehend detailed policy and protocol information as well as being able to remember and follow shelter rules. Volunteers must be able to understand and fulfill all responsibilities of their role independently. If an individual cannot volunteer on your own, we may require that someone comes to assist. Volunteers must be able to physically fulfill the duties of their volunteer role. Most volunteer roles require volunteers to: be able to stand, and/or walk for up to 3 hours; be able to lift and carry up to 20 lbs. Some positions are more physical than others and require being able to lift 40 lbs. Volunteers must be able to have regular access to the internet and an email account. Costs & Supplies – all volunteers need to purchase a volunteer t-shirt and name badge for total cost of $10+tax. We do not offer court-ordered community service. Please contact the Volunteer Center of Door County at 920-746-7704, to see which organizations do offer court-ordered community service. Below are the positions we're currently in need of at the Door County Campus. You will learn more about them at your Volunteer Information Session. Foster - If you are interested in becoming a foster parent to an animal in need, please visit our Foster Information Page. Step 1: Attend Volunteer Information Session. The Volunteer Information Session will give you the opportunity to hear about our organization, our volunteer program and expectations, and what our current needs are. Please register for an upcoming session at the Door County Campus on our calendar here. Step 2: Once you have attended the Volunteer Information Session, you will be given a link to complete the volunteer application. Step 3: Once we have received and reviewed your volunteer application, we contact you to schedule your training! I am under 13 years of age and I am very mature, do you make any exceptions to your minimum age? For the safety of our volunteers and animals, we do require that all volunteers be at least 13 years of age to volunteer with any adult. There are a few options for youth to volunteer on their own, such as Shelter Crew (in which you can be 16 and up). We have many other ways for youth to support the animals and learn about animal welfare. 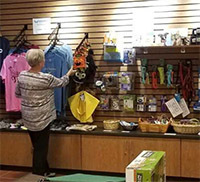 Please click here to get ideas on how to make toys for the animals, hold your own fundraiser or collect items from our “wish list” from the surrounding community to support the animals. Youth can also consider having a parent apply to be a foster volunteer. Although the primary volunteer must be 18 years of age, the entire family can participate in the fostering experience. Will I have training before I start to volunteer? Yes. Each role has training sessions that cover all aspects of the volunteer role. Training is done with both staff and volunteer mentors. The time it takes to complete training varies, based on volunteer availability, training schedules and the specific training needs of the volunteer role. I don’t have a computer or email; can I just fill out a paper application? Due to the high volume of volunteer applicants we receive each year and the costs associated with paper applications, we are no longer able to process paper applications. The most cost-effective way for us to communicate with volunteer applicants and our current volunteers is with online services and email. For this reason, we have moved our application process online along with all of our volunteer scheduling. Can I be a part of the volunteer program if I have a criminal background? WHS requires all persons applying to volunteer to state any past criminal record and reserves the right to conduct a background check on any volunteer. A criminal background does not necessarily immediately disqualify you from volunteering. Volunteers are scheduled one shift per week, what if I am going on vacation? We understand that life can be busy and have made our scheduling process as flexible as we are able. To make scheduling easy to manage, volunteers have a set schedule working the same shift time on the same day of the week. Volunteers manage their own schedules online and we allow for regular vacations and pre-arranged shift adjustments. When removing themselves from the schedule, volunteers are welcome to pick up a make-up shift, but it is not required.